If you like this site you may vote for it by clicking on this banner. This is just a mad collection of people who have, or had, Borthwick as a middle name. Somewhere, sometime, they probably linked into a serious Borthwick family. Aside from one special one I haven't included members of my own family on this page. There must be at least 50 descendants of John Borthwick & Elizabeth Dinwoodie who would qualify. Please email me if you have a connection to any Borthwicks mentioned on this page, or if you know of another "Borthwick in the Middle" family. I'd be happy to add further data. On a site dedicated to First World War Honours & Awards to Canadians in British Flying Services by McKay, E.A. to Nunn, H.L. is the story of the following "Borthwick in the Middle". Lieutenant (Acting Captain) Guy Borthwick MOORE - Military Cross awarded as per London Gazette dated 13 May 1918. Born in Mattawa, Ontario, 28 May 1895; home in Vancouver; attended UBC (Arts, 1913-16; member of Vancouver Rowing Club and university rugby team); qualified as Lieutenant, Irish Fusiliers of Canada, 1916; joined RFC as Cadet, December 1916; to England, January 1917; Oxford, 23 March 1917; obtained wings, August 1917 with commission as 2nd Lieutenant effective from 26 April 1917 (Flying Officer, 8 June 1917). Served in No.1 Squadron, 16 August 1917 to 7 April 1918 (killed in action). For conspicuous gallantry and devotion to duty. He led a patrol to attack hostile balloons. The patrol drove down three balloons in a collapsed condition, one of which he accounted for himself. He has also destroyed three enemy aeroplanes and driven down three others out of control. He has always shown splendid courage and resource. Alexander Borthwick MURRAY was born 14 Feb 1816 in Eskdalemuir, Dumfriesshire, Scotland. 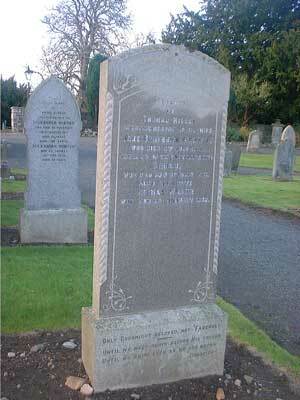 He was the sixth child of 13 born to John MURRAY and Esther COWEN. Alexander was one of the earliest and most successful pastoralists in South Australia. With his brother John, of Mt Crawford, they founded the famed Murray Merino flocks. When he died in 1903 he was the owner of Wirrabara Estate and other valuable properties. David Borthwick MASSON. Son of James Masson and Eliza Jamieson Borthwick. I don't know where Eliza fits into any Australian Borthwick family so would be interested in hearing from Masson descendants . David Borthwick Masson married Mary Black, in 1909 in Victoria, Australia (Reg No 4646). They had a son, John Borthwick Masson, and a daughter, Margaret Josephine Masson. In 1912 in Victoria Australia Andrew Borthwick SANDERSON married Charlotte Eliza Emily Excell. Andrew had been born in Scotland in about 1868. His parents were probably Joseph Turnbull Sanderson and Christina Borthwick. Andrew Borthwick Sanderson died in Victoria, aged 90 years, in 1968. He and Charlotte Excell had had four daughters: Jean Frances, Ena Irene, Marjory Carey and Ruby Allan. Thomas Bothwick SMITH married Mary Jane Martin 27/5/1897 at "Gordonbrook" near Grafton, in the home of Mr Hawkins Smith. Who was he? Was the middle name really Bothwick, or was it Borthwick? On the Digger index to South Australian Births 1842-1906 there are quite a few with Borthwick (or Bothwick) as a middle name. What was their connection to Borthwick families? William Borthwick Johnstone (1804-1868), a Landscape and history painter in Scotland, was the first curator of the National Gallery of Scotland. One couple both had Borthwick as a middle name - Mary Borthwick Jardine married James Borthwick Dowdall and lived at Lockerbie in Scotland in the 1930s. Related families are JARDINE, SPENS, PALMES, GEDDES, BORTHWICK, BRUCE (in Scotland). Jane Borthwick Chalmers, wife of Thomas Miller. Her grave is in Abercorn Churchyard. Robert Borthwick Adam, 1863-1940, wrote "Printed only for a few friends". Imprint Buffalo, N. Y Printed by Buffalo Volksfreund Printing Co 1925. He noted that this was a "Catalogue of some of my books, not by Johnson or Boswell, and I have omitted Goldsmith and one or two other authors." The Ardrossan & Saltcoats Herald's weekly article "From The Herald Files", a look back 100, 50 & 25 years, recorded that on 19 October 1900 "Mr Alex Borthwick Mackay, son of the Revd James Mackay, assistant minister at Ardeer, has taken an MA degree with first class honours in mental philosophy at Glasgow University." "Gravestone Transcript. "In Memory of Mary Helen Glendinning daughter of Archibald Glendinning and Mary Douglas who died 17 May 1854 aged 4 months also Douglas Glendinning (MD LRCSE) their son who died at Albion House, Bingley, Yorkshire 12 January 1871 aged 29 yrs also the above Archibald Glendinning born at Effgill, Westerkirk 31 August 1811 died at Langholm 25 Jan 1888 also Mary Douglas his wife who died 11 June 1891 aged 74 also Janet Borthwick Glendinning their daughter who died at Langholm 25 February 1892 aged 46 yrs interred in Staplegordon Churchyard" Kirk Wynd Cemetery, Langholm, Dumfries." If you have information about this marriage or any descendants I would be very pleased to hear from you as I suspect there may be a connection with my Australian Borthwick family. and the youngest "Borthwick In The Middle" I know of ....? Henry Borthwick KING: A great-great-great-great-great grandson of John Borthwick & Elizabeth Dinwoodie / Dinwiddie. He was born in Australia in 1986. Copyright 2001, Ann Carson. All rights reserved.